The 'Plate Tectonics' is a theory that explains how the present day earth has formed- the evolution of continents, sub-continents and islands, which are directly related to the formation of various types of rock and hence the minerals including few gemstones. These plates form beautiful gems and also cause natural disasters like volcanoes, earthquakes and tsunamis. Here, referring gemmology, the very basics of plate tectonics and their role in the formation of gemstone deposits has been discussed. 90- 100 million years ago, Australia and New Zealand separated from Antarctica while Madagascar and Seychelles separated from India as a result of migration of India towards Northwards away from Africa and Antarctica to collide with rest of Asia and forming the present day Himalayas, which are as young as ~10 million years. The breakup of Pangea resulted in a number of plates, which are associated with the present day continents and sub-continents. There are a number of plates around the globe, but the major ones are listed below and illustrated in figure 2. With time each of the continents has separated to their current positions (see again, figure 1). The geometric fit of one continent as seen between South America and Africa, gives credibility to this very important theory. This is also responsible for the explanation of the major gem belts in the world. This theory puts forward the association of the rock types, mineral associations and the geological processes which are observed in various continents. The plates are solid rigid bodies with varying thickness of 6- 10 miles, composed of Basalt i.e. a dark coloured rock, low in silica, containing pyroxene and olivine with feldspar. These rock-bodies rest on the semi molten mantle and hold the crust upon them, which includes continents as well as oceans. These plates are divided into several smaller units, making up the earth's crust, and hence, there is some sort of joint between the individual units (plates). This joint may also be referred to as boundary or more specifically, 'plate boundary'. Although, the plates are solid rigid bodies and are usually stable, the boundaries are volatile and unpredictable. Most of the disturbances occur along or closer to the plate boundaries which results in pushing up of hot magma to the crust that ultimately results in volcanoes and earthquakes. 1. Convergence, wherein two plates move towards each other and commonly results in the formation of mountains through folding, thrusting or thickening (figure 3). An important process known as 'Subduction' is a common mechanism which results in formation of new minerals / rock. In subduction, a plate dips downward beneath the other, carrying the scraping of the edge of another plate or the sediments present at the trench, resulting in rise of temperature and pressure in the mantle (figure 4). 3. Transformation, wherein two plates move sideways, crushing each other (figure 6). What makes these plates to move? The motion between the plates is due to an active internal mantle process, known as ‘Mantle Plume’ or ‘Hot spot’. Mantle plume is an upwelling of hot magma into the crust by way of temperature gradient within the mantle. Major consequences of the movement of plates happen along the plate boundaries which shakes up the crust and results in earthquakes and volcanoes. However, it also results in melting and re-solidification of the existing rocks present along the plate boundaries. It carries the sediments already present at the trench, which melts due to the higher temperature caused by the collision and that of mantle. This hotter and molten silica and basalt begin to seep through the fissures in the rock beds within the crust (figure 8). Steam and acids are formed due to the presence of water, which mixes with the volatile gases and starts moving into the fissures in the surrounding rock beds, which later on cools down to form new rocks and minerals. If the intensity of collision is very high, the magma reaches the surface of the crust, in the form of volcanic eruptions. The magma that reaches the surface may solidify (a) on the surface, or (b) within the crust in the form of different bodies of igneous rocks. The magma that has come up through these eruptions consists of basalt, silica and a number of chemical elements that leads to the formation of different minerals and rock bodies. The magma that erupts to the surface may also carry already formed minerals such as topaz, garnet, olivine or diamonds to the surface, while the one retained within the fissures in the crust leads to the formation of rock bodies like lacoliths, batholiths, dykes, pegmatites, hydrothermal veins, etc and hence the minerals or gemstones within them. When two continental plates collide, heat and pressure is generated (figure 9). This result in the melting of pre-existing rocks and re-solidification that leads to the formation of a new mineral and a rock, i.e. metamorphic origin. Most of the gemstones are found / formed in the following types of deposit which are associated with direct solidification of magma. Pegmatites: These are granitic rock bodies (i.e. consists of quartz, feldspar and mica) where most of the gemstones are formed and found especially, the silicates. It is the last stage of solidification of magma and hence, the minerals form here crystallizes at lower temperatures. Pegmatites are one of the most important rock bodies to explore for gemstones as it produces larger crystals. These deposits are mainly concentrated in Brazil, which produces almost every stone, with some scattered deposits in California, Nigeria, Mozambique, Madagascar, Afghanistan, Urals - Russia, Pakistan, India and China. Hydrothermal Veins: A type of igneous deposit where water plays an important role in solidification or crystallization of Magma. Stones like Topaz, Beryl, and Benitoite are the common features of this type of deposits. These are commonly found in Columbia, Brazil, Zambia, Russia, and California. Basalts / Magmatic Gem Deposits: This type of deposit is common for corundum and pyroxene and olivine group of minerals. These deposits are associated with direct crystallization of magma at a high temperature. These deposits are found in the Southeast Asia including Burma, Thailand, Vietnam and Australia. Other similar deposits are located at Brazil, Kenya, Tanzania, Austria, Pakistan, India, Russia, Vietnam and China. The eruption of hot magma or change in temperature-pressure conditions due to metamorphism, which results in the formation of various rock types is a continuous process. And one type of rock keeps on changing into another type with the time, for example, a volcanic eruption results in the formation of igneous as well as metamorphic rocks, which may be exposed to the surface or lie within few metres to the surface. These rock bodies are disintegrated by the external as well as internal forces (such as rain water or underground water) of the earth and its environment to turn into a sedimentary rock or simply sediments. These sediments may again turn into fresh igneous or metamorphic rocks and hence minerals. This is known as the 'Rock Cycle' (figure 10). The Central - South - East Asia. Two separate belts may be considered in Asia. One starting from the Urals in Russia, through Afghanistan, Tajikistan, Pakistan, Nepal, to Burma, and the other one from Sri Lanka to south - southeast India going into Burma, Thailand, Cambodia and Vietnam. All these localities are associated with metamorphic and basaltic deposits with granitic intrusions of pegmatites. 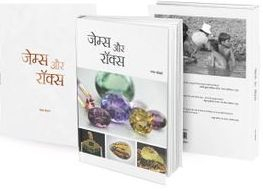 Each of the individual countries is well known for their gem deposits and the numerous gemstones which are found there. These deposits have been formed during the splitting up of Gondwana, when the Indian subcontinent moved towards the North to collide with the rest of Asia (Eurasian mainland). During this process, the toughest material – Jade was formed, which presently is mined in Northwest region of Burma, the region of collision of the two land masses. Further, this collision also resulted in the formation of world's premier ruby deposits at Jegdalek (Afghanistan), Kukurt (Tajikistan), Hunza and Nangimali (Pakistan), Chumar (Nepal), Mogok and Mong Hsu (Burma), Yuanjiang (China) and Luc Yen (Vietnam). The most important gem bearing region in Burma is the ‘Mogok Belt’, which has formed due to a continuous collision along the line of fault extending from north to south. The intrusion granite increased temperature - pressure conditions and gave rise to a number of high quality minerals, such as ruby, spinel, peridot, zircon and many more. This gem belt extended further to the southeast towards Thailand, Cambodia and Vietnam, where a series of small volcanic intrusions gave rise to Basaltic deposits and thus the formation of the minerals such as corundum, spinel, tourmaline, zircon, etc. While in Vietnam (at Luc Yen), granitic rocks intruded into limestone, to give rise ruby and spinel deposits, which as fine as Burmese stones. Another concentration of gemstones in the same region is in Sri Lanka, which got separated from India and Africa to form deposits of world famous sapphires and a number of other minerals. 2. East – Southeast Africa. The second major concentration of gemstones is located at at east - southeast Africa along Kenya, Tanzania, Zimbabwe and Zambia. The major belt in this region is ‘The Mozambique Belt’, which extends for at least 5000 kilometers – the complete eastern part of Africa- from North to South. The gemstones formed here are rich in chromium and vanadium. This is one of the reasons why, a number of colour- changing stones are also found in this region such as garnets, sapphires, tourmaline, etc. This belt can also be connected to the deposits of Sri Lanka and India, since both these land masses were once the part of southeastern Africa. The most important deposits are located along Umba valley in Northeast Tanzania, with others at Mgam Ridge and Mangari Swamp in South Kenya while at Morogoro in east central Tanzania. The deposits in this region are associated with divergence and collision mechanisms leading to intense thermal metamorphism, where volcanic basalt and other sediments formed the Mozambique Belt. The Rift valley of East Africa is the best example of Divergence mechanism that gave rise to number of minerals and is an important region for the gemstones that are being mined currently. 3. East - South America. Another major deposit is located in the eastern part of South America at Brazil, which is also considered as the 'Paradise of Gemstones’, due to the fact that almost every gemstone is mined at Brazil. Gemstones at Brazil are found in pegmatites as well as hydrothermal veins and metamorphic deposits associated with mica schist.The South American continent is bounded by number of plate boundaries - South American Plate in the east, Nazca plate in the west and Caribbean plate in the north. This compresses the continent and as a result pressure is created in the mantle which forces the magma to move to the crust, where it solidifies in the form of pegmatites or hydrothermal veins – the most common type of deposits found in this area. 4. Western North America. Another belt is running in the western part of North America where the deposits are located at California, Montana, Wyoming, Arizona and Utah. All these deposits can be associated with the subduction region along the coastal areas of the western part of the continent. The subduction along this North American plate occurs along with the transformation of the pacific plate. Other deposits are located in Australia especially the eastern part at New South Wales and Anakie Fields, which can be associated to the pressure and temperature created by the subduction of pacific plate into the Australian plate. It is very well established that the different motions of the plates cause disturbances in the earth’s crust and the mantle, which forces the magma to rise up to the surface or within the crust. This magma cools down to form different rock bodies and hence the gemstones or minerals. The most important mechanism in the formation of rocks or minerals is the subduction of one plate beneath the other. However, subduction of a plate at one point leads to divergence at another position, hence, the same plate can produce disturbances at two different areas which might be thousands of kilometres away from each other. The western part of North America- following the western coast and extending to the western coast of South America. The southern part of Europe– covering the central – eastern part going through Asia in Afghanistan and Pakistan – following the Himalayas and passing through Burma, southeast Asia which is an ideal example of subduction or convergent boundaries that form mountains and ultimately the gemstone deposits. The Subduction boundary is following the eastern part of Japan – merging into pacific plate –the eastern part of Australia being subducted by the pacific plate. All these regions are associated with the gemstone deposits. Pacific plate boundary, which is following the western coast of North America in California. The most important divergent plate boundary lies in the eastern part of the African continent where it has formed the ‘Rift Valley’, which produces a number of minerals and gemstones, all along the eastern Africa from north to south. The gem belts and the plate boundaries exhibit a promising relation with each other as a comparison is being done between several gem belts/ deposits of the world and the plate boundaries (see again, figure 11). However, this is a well known fact that the temperature and pressure conditions should be stable for a mineral or gemstone to form or crystallize, which cannot exist right at the edge / boundary of a plate. Therefore, when one looks at the position of plate boundaries and the gem deposits around the world, the deposits are lying at a distance of few to several hundreds of kilometres, depending on the type of deposit, but they follow the direction of plate boundaries. However, in some cases, these plate boundaries are very close or coincide with the deposits as well, as in case of north-west Burma, Urals, Himalayas, etc. Nassau K. (1981) Plates, Quakes, Volcanoes and Mt. St. Helen’s. Part I: Plate Tectonics, Lapidary Journal, May issue, pp 456-462.